Let’s begin with a boring statistic: 8.1 percent. According to an American Religious Identification survey, that’s roughly how many Americans in 1990 were willing to identify themselves as having “no religious identification.” Fast-forward eighteen years to 2008 and that same ARIS study number becomes 15 percent. Give it four more years in the Pew Forum on Religion and Public Life’s 2012 study it becomes 19.3 percent. That’s one in five Americans. In other words, in a space of about 20 years, the number of Americans willing to claim no religious identity has doubled and there is no indication that trend is slowing down. This is the fastest-growing religious demographic in America. The statistics aren’t as boring anymore, now are they? 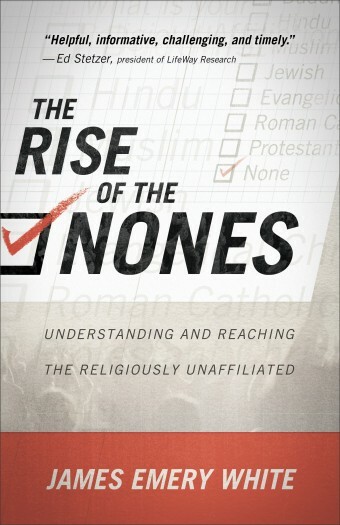 In The Rise of the Nones: Understanding and Reaching the Religiously Unaffiliated James Emery White steps in to provide an answer, or rather, a vision for the American church to reach those Nones with the gospel of Christ. As the former president of Gordon-Conwell Theological Seminary and the founding pastor of Mecklenberg Community Church—one of the fastest growing churches in the nation—he seems particularly qualified for the task. With a clear, engaging style, vivid illustrations, biblical roots, and a proper sense of history, White lays out a clear path for churches to make the changes necessary to deal with the shifting religious sands. The book breaks down into two parts. In the first, White tells us who the Nones are, and in the second, he lays out a plan to reach them. Always helpful to have brief, readable book reviews. Appreciate this brief, question-posing look at the book ‘The Rise of the Nones’ (number of American people willing to declare they have no religious affiliation). I am not sure what the UK figures would be (scary at the least) but the same question will, of course, be asked of the church here.